The term "green papayas" refer to the raw, unripe fruits of the papaya tree. Used in both everyday cooking and manufacturing, the green papaya contains high concentrations of latex, a milky white liquid that contains the enzyme papain. Thanks to this important phytoconstituent - and a few others - green papayas have been widely used in traditional folk medicine as treatments for constipation, jaundice, malaria, worms, and even issues with reproductive health. Extracted and sold commercially as papaya-based health supplements, papain is more abundant in the immature green papaya fruit than in ripe papaya. Papain fosters digestive health by breaking down proteins and supporting proper absorption of vitamins, thus contributing to make the most of papaya nutrition. GREEN PAPAYA EXTRACT HAS SHOWN EFFICACY AGAINST GASTRIC ULCERS. Unripe papaya contains terpenoids, alkaloids, flavonoids, carbohydrates, glycosides, saponins, and steroids that protect cells from damage, regulate motility, stimulate wound healing, and support skin health. Additionally, eating green papaya benefits the cardiovascular system by lowering blood pressure and cholesterol levels. One of the most noticeable differences between ripe papaya and green papaya nutrition is that the latter contains only half the amount of sugar. Despite this, green papayas still manage to provide about 80% of the energy that raw, ripe papayas do. WITH ONLY 35 CALORIES PER 100-GRAM SERVING, GREEN PAPAYA DOES INDEED CONTAIN MORE FAT AND FIBER THAN ITS RIPENED COUNTERPART. While content depends greatly on the papaya varieties and types, as well as on the growing conditions, green papaya shows higher levels of papain and potassium, moderate amounts of protein, carbohydrates, magnesium, and calcium, and low levels of carbohydrates like sugar. The presence of vitamin C (ascorbic acid) typically increases as the fruit grows to full maturity and decays after it ripens. Although preparing them as vegetables in fresh, brightly-colored salads and Asian-inspired soups seems to be more popular, green papayas can also be pickled and candied. Cooking or boiling is the obligatory first step in preparing any green papaya recipe, since heat deactivates the toxicity of the unripe fruit's milky white latex. In many areas, green papaya juice and flesh are used to tenderize meat several hours prior to cooking. In Puerto Rico, green papaya preserves are canned in sugarcane syrup and either sold locally or exported. In southern Asia, they are the shining star of unique and distinctive curry dishes. Green papayas can trigger adverse reactions in certain individuals. When topically applied as a treatment for skin issues, such as eczema and acne, papain extracts can cause severe cases of itching, swelling, and redness. People with latex sensitivities are likewise strongly discouraged from consuming green papaya. Meanwhile, early medicinal systems have long regarded green papaya as a contraceptive and abortifacient herb. Preclinical trials, while abundant, have been largely inconclusive on the issue of green papaya's potential anti-fertility properties. Thus, pregnant women and nursing mothers should avoid consuming it. Considering that it is derived from underdeveloped fruits, it seems only logical that the nutritional value of green papaya should be far inferior to that of the fully ripe papaya. Instead, researchers have successfully uncovered many outstanding health benefits of green papaya use. 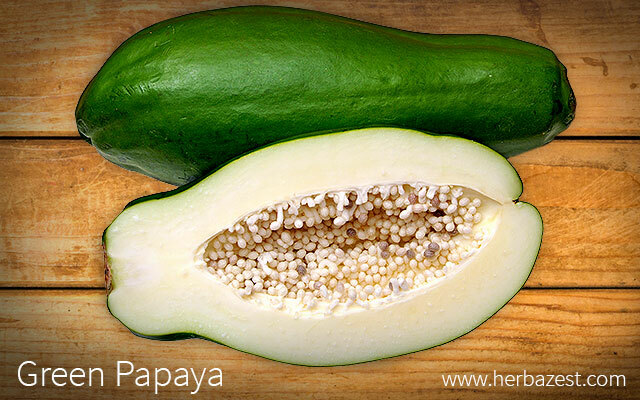 Chockfull of healthful compounds, green papaya delivers powerful medicinal action in its own right.